Muttai Bread Upma, today we will see how to prepare egg bread upma which is not only easy to prepare but also delicious. You can either use store bought or homemade bread to prepare this upma. I have added only eggs to upma whereas vegetables like carrot and peas can also be added which increase the nutritional value. 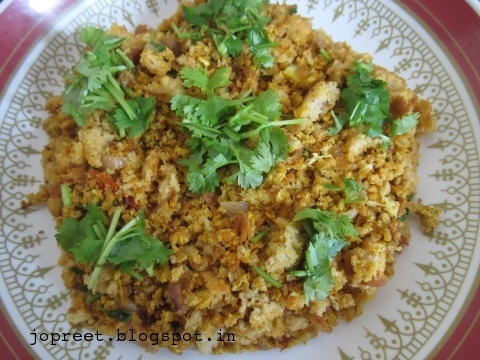 Serve bread upma for breakfast or quick evening snacks. Kids would love this for sure. Some of the upma recipes shared in my blog, Kozhi Bread Upma, Muttai(Egg) Bread Upma, Pori Upma, Sago Upma, Lemon Varagu Semiya Upma and Milagu Aval Upma. If you try any of my recipes, then do share your feedback with us. Please do check our YouTube channel for the recipe videos and subscribe us if you like the recipe. Chop bread into small pieces. Heat oil in a kadhai and temper mustard seeds and curry leaves. Fry onions till it turns golden brown. Add ginger garlic paste, tomatoes, cumin powder, sambar powder and coriander powder. Mix all and add 1/4 cup water. Cook for 2 mins. Break eggs to this masala and scramble the eggs. Add salt to taste and mix all. Now add bread pieces and mix well. Garnish with chopped coriander leaves.